For ABC Wednesday, brought to you by the letter “E,” and for my poetic haven, Poets United. 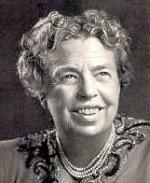 Eleanor Roosevelt was, in my opinion, the greatest First Lady in history. Not only was she an invaluable advisor to her husband, but she constantly fought for human rights, for women’s causes… and she did so knowing that she was neither “comely” nor possessing of any powers other than her own personal tenacity. She loved Nancy Hickock (AKA “Hick”) for years, and although her embarrassed family attempted to destroy any evidence of that relationship, many letters survived. Franklin, likewise, had extramarital affairs; however, they remained a couple committed to the common good. Monday Twofer, Three Sites: ABC, Real Toads, and 3WW! After a weekend of seeing our brilliant youth and their adult mentors in the church’s summer musical, then ministering on Sunday morning with the Edge Band, you’d think I’d be all tuckered out. In truth, it’s those busy weekends that sometimes set me behind the 8-ball of posting to last week’s prompts! Ye,t last night, I was up until 3 writing to a prompt from Joseph Harker (see last post, an ekphrastic poem), bitten by that late-night manic muse. Here are two poems written for three sites. Enjoy, as I bask in cool air here in Wisconsin, an increasing rarity these days. For ABC Wednesday. This, written for the letter D, is about my Big D, Depression. Also for The poem’s imagery comes from Teresa of Razzamadazzle, hosting the prompt at Imaginary Garden With Read Toads. If you’d like to see the images from which this poem arises, please click HERE, as I didn’t have time to write Teresa for permission to reproduce them on my blog… believe me, they are stunning photos. If you’d like to read more of Teresa’s work, try here: Razzamadazzle. None will glow within my empty nest. Image from Breastfeeding.com. I strongly support moms who nurse their babies in public. We have enough “Wardrobe Malfunctions” on TV; why are folks repulsed by what Mary did for her baby, a ritual as old as time, and always practiced tastefully, lightly covered. I also know some women aren’t lucky enough to experience this bonding, and my heart goes out to them. For Three Word Wednesday (yeah, I’m running behind on this Monday morning! ), giving us the words Emotion, Falter, and Touch. Thanks to Thom at 3WW for hosting this wonderful weekly challenge!